Any parent can tell you that young children are still learning, well, everything. This is true in and out of school. Just as young children need to be taught how to read, write, and engage in a classroom, they also need to learn how to identify, understand, and manage their feelings, and how to respond to behavioral expectations and norms in a learning environment. When a young student misbehaves, the appropriate response should be to teach desired behavior, not punish the student. Unfortunately, in many schools, that’s not happening. Although suspending young children is unfair and entirely counterproductive, it is surprisingly common. Spokane Public Schools suspended 110 kindergarten and first graders during the first 35 days of school this year, more than double the rate of suspension and expulsion for high school students in the district. To put it another way, the district suspends more 5- and 6-year-olds from school than it does 14-18-year-olds combined. In fact, Washington schools suspended or expelled over 6000 students in kindergarten through third grade in the 2015-2016 school year. When school suspend or expel young children, they alienate those students from the learning environment. 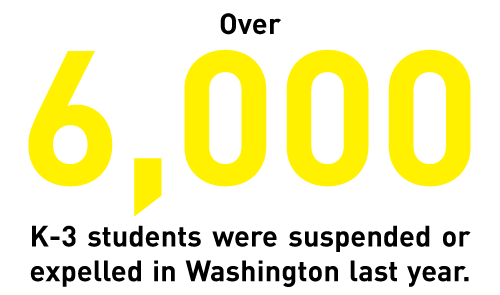 Suspension sends a message to excluded students that they don’t belong in public schools. As the U.S. Department of Education and U.S. Department of Health and Human Services recognized in guidance letter, “A child’s early years set the trajectory for the relationships and successes they will experience for the rest of their lives, making it crucial that children’s earliest experiences truly foster – and never harm – their development.” Suspension and expulsion of young children also have negative consequences for families: parents may have to miss work to care for their children. Suspension and expulsion are counterproductive to student learning. Students miss academic time that is crucial to their long-term academic achievement. They also fail to learn the skills necessary to modify their behavior and solve problems. Suspension teaches students that retribution and exclusion are appropriate ways to respond to conflict, instead of teaching students how to communicate and engage with others when there are problems. It should come as no surprise that suspension and expulsion are associated with lower levels of academic achievement, even controlling for other demographic factors. Teachers and schools deserve better tools to help teach students appropriate behavioral expectations and support struggling students. This may involve changing expectations for very young children, and, as the American Academy of Pediatrics advocates, building in more time for unstructured physical activity and play during the school day. Schools should train staff in implicit racial bias, given the significant disproportionality in suspensions and expulsions of black children in early grades. In addition, schools should also train teachers and engage counselors and support staff to work with students whose behavior may be a product of early childhood trauma. All of these approaches rightly focus on setting young students up for success, rather than failure. The first step, though, may be to simply do away with suspensions for young children. A number of states, including Connecticut and New Jersey, have recently passed legislation to eliminate or severely curtail the ability to suspend and expel the youngest students. Washington’s legislature should do the same. Arc of King County: Discipline rules change, but will it matter?